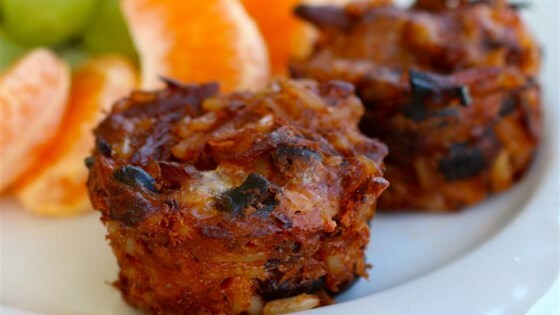 "Easy to make, versatile, and kid-approved cheesy BBQ rice bites are perfect for after school snacks or as an appetizer at your next get together." Preheat oven to 400 degrees F (200 degrees C). Spray mini muffin tin cups with cooking spray. Prepare rice according to package directions. Allow to cool slightly. Combine rice, black beans, barbeque pulled pork, cheese, and eggs in a bowl; mix well. Drop mixture by heaping tablespoons into prepared mini muffin tins, filling each cup to the top. Bake in preheated oven until hot, about 20 minutes. Allow bites to cool 5 to 10 minutes before popping them out of the muffin tin. BBQ chicken can be used instead of pork.